Hospitality. A word that’s practically synonymous with the South, and a trait that’s valued here above many others. While I am most definitely a daughter of the South, “Southern Hospitality” is something I’ve often looked on with cynicism. The word stirs up images of a perfectly set table, a well-thought-out meal, and flawless hosting abilities. Feeding this notion are multitudes of magazines and endless Instagram feeds suggesting hospitality should be paired with the latest entertaining trends to truly make guests feel welcome. Abilities like these take time and planning–and y’all know how I feel about dreadful planning. Hospitality quickly became a goal I was content allowing others to strive for. But I was reminded of the truth about hospitality when Jake McGlothin shared a message on the topic at Floris United Methodist Church. Jake, a New Orleans native, spent 2 years in The Republic of Armenia with the Peace Corps. Living with a host-family there, he says, shaped much of his understanding of true hospitality. In Jake’s message, based on Luke 14:1-14, he hones in on what true hospitality is and why true hospitality matters. Hospitality defined is attending to people’s needs, honoring the value of others and giving your best. After describing what hospitality is, Jake continues to explain why hospitality matters. 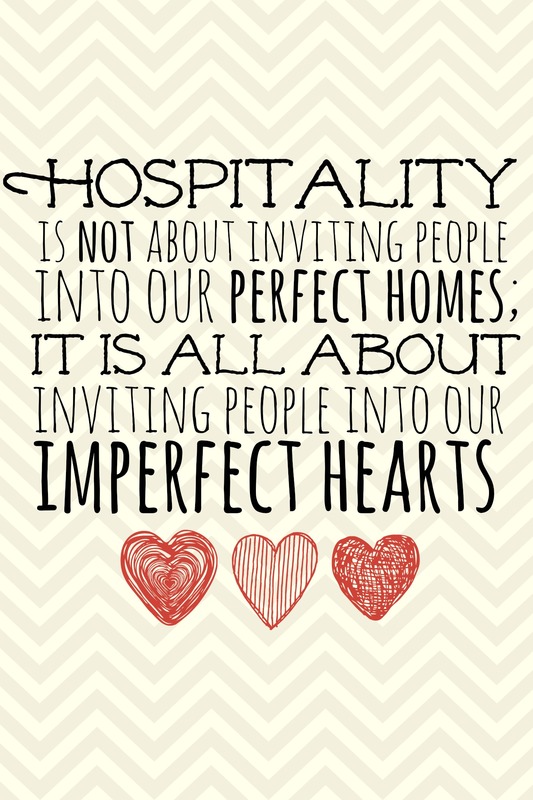 Very simply stated, true hospitality is an act of love. 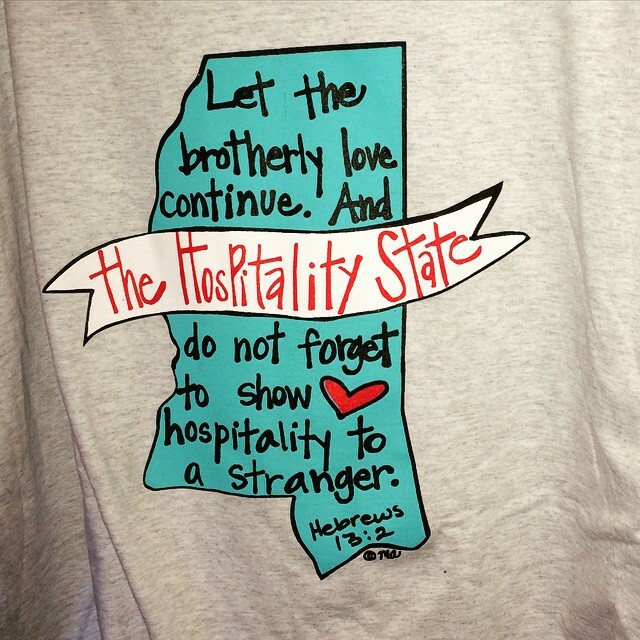 Throughout his message I kept in mind the motto of my home state, Mississippi–The Hospitality State. I thought about all the ways I’ve seen people attending to needs, honoring the value and giving their best across the state. People I know fostering children, families I know building playgrounds in urban areas and doctors I know seeing uninsured patients for free. 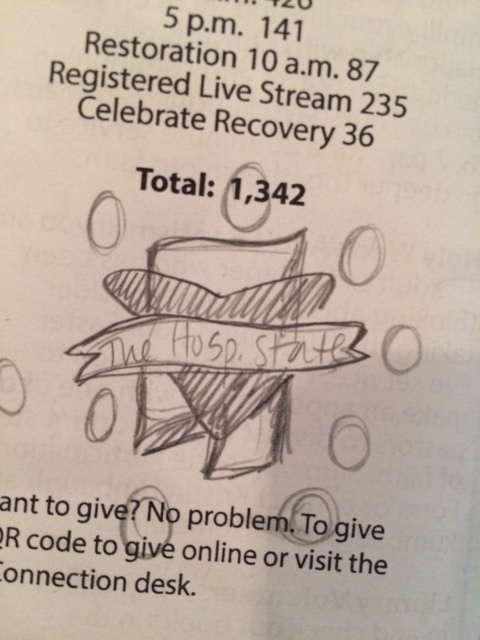 So I jotted down a quick doodle of my home state and eventually it became a tee shirt. It’s my favorite A Little Happy design because it represents how I feel about Mississippi, a state overflowing with brotherly love. I love the word “stranger” in the verse, because of the multitude of people from around the country–be it regular travelers or celebrities–who’ve shared their beautiful experiences working in and visiting Mississippi. I also love it because God reminded me that day that hospitality has nothing at all to do with adorable decor, clever table-setting or even the amount of time spent in preparation. Hospitality that the Lord welcomes has little to do with presentation and much to do with motivation. And while nowhere is perfect, I do believe Mississippi is aptly named–The Hospitality State. Tee shirts are available at Mill Town Mall in Wesson, Mississippi. Limited sizes are also available at Etsy. To listen to Jake’s entire sermon, simply click here.